Combining the two drills above we have come up with our version of the WAR Rebounding drill. Split players into two equal teams. Assign each player a position number (e.g., 1, 2, 3, 4, 5). Place the team starting on Offense in the corners, wings, and point. Place the team starting on Defense in a single file line starting just in front of the basket and under the free throw line. Coach passes to an Offensive player and calls a Defensive player’s number. Defensive player executes a close out on Offensive player. For example, Coach yells 3 telling #3 to close out on the shooter. Offensive player immediately takes shot. All Defensive players locate an Offensive player to block out. Play continues until Offense scores or Defense secures rebound. If Offense scores, the team on Defense executes their secondary fast break. If the Defensive team secures rebound, they execute their fast break with the Offensive team transitioning to Defense. Once the original Defensive team either scores or is successfully defended, the teams flip roles on the other end of the floor (i.e. Offense goes to Defense, Defense goes to Offense) and we restart the drill. 1 point – Offense scores on initial shot. 1 point – Offense secures rebound on initial shot. 2 points – Offense scores off of Offensive rebound. 1 point – Defense secures rebound on initial shot. 1 point – Defense scores in transition. 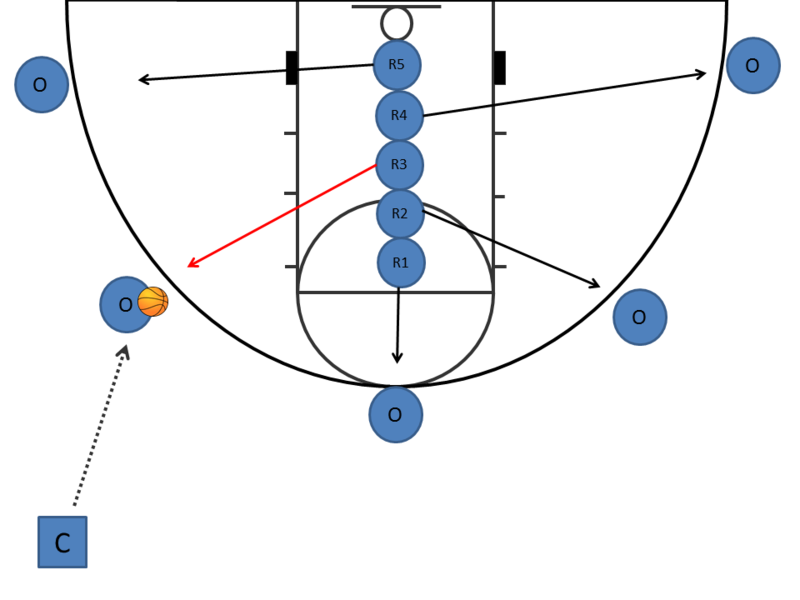 Execute drill for set period of time (e.g., 10 minutes). At the end of the drill the losing team either runs or does pushups. If you need more drill ideas, please take a look at our YouTube library of youth basketball drills. There is constant pressure on the ball. Gap and Help defenders protect the paint/lane area and limit the number of layups enticing the opposition to shoot lower percentage shots from the outside. It takes offensive players out of their comfort zone by constantly forcing them to their weak hand. There is no confusion on box out assignments. It keeps kids engaged and involved. It is simple to learn and can be taught with limited practice time. It helps average teams be more competitive. In our previous Youth Football Drills blog post we turned our attention to the defensive side of the ball with the DB Read and React Drill. In this post we are going to share a Defensive End Box drill we developed several years back to help teach our Defensive Ends how to properly box. If you are not a fan of boxing your Defensive Ends and prefer the Spill and Kill technique, we highly recommend you take a look at Coach Wilkins’ X’s and O’s of “Spill and Kill” Contain clinic. 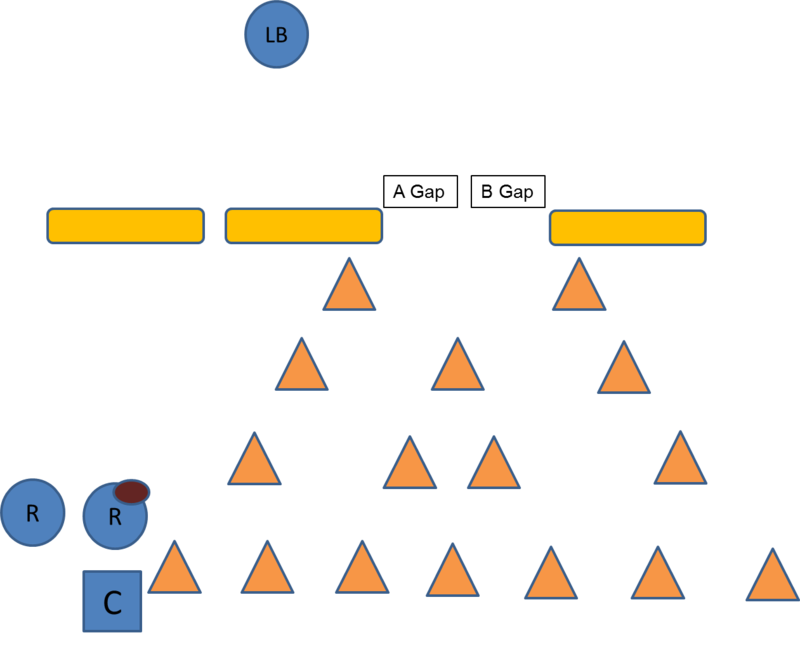 Setup up cones and players to represent a Double Tight, 2 Back Split Formation. Setup up cones to designate the Sweep Alley/Spot on each side of the ball. Defensive End turns their back. Coach tells the blocker and runner which hole to run to (Off-Tackle or Sweep) and snap count. Note: Run away from the Defensive End from time to time to make sure that they are pursuing through the backfield properly. On the snap count the blocker and runner run to the designated hole with the Coach handing or pitching the ball to the runner. The runner must stay between the cones (Off-Tackle or Sweep). The Defensive End gets to the Sweep Spot, meeting the lead blocker, shedding the block, and tackling the runner. They need to fight to force the runner deeper than the “Sweep Alley” or squeeze him inside the Off-Tackle hole. When shedding the block, they position themselves where their outside arm is kept free to make a tackle and their inside foot is splitting the feet of the blocker. After cycling through several reps, switch to the other side. In our previous Blog posts we shared a couple of youth football drills that we like to use with our Offensive Line and Running Backs and Receivers. In this post we are going to turn our attention to the Defensive side of the ball with a drill we call DB Read and React. The purpose of this drill is to teach the Defensive Backs how to read the play to determine whether to execute their run fit or to defend the pass. Use 4 cones as Offensive Guards and Tackles. 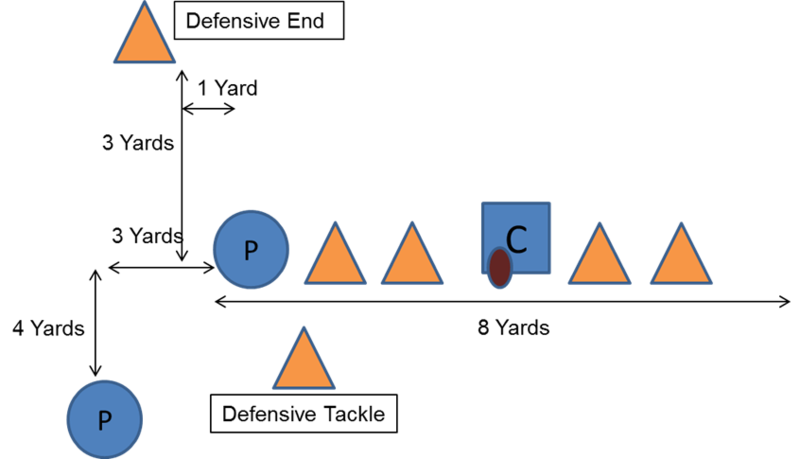 Designate 1 cone as a Defensive End and another as a Defensive Tackle. Note: The Drill is setup for a defense that uses boxing Defensive Ends and the Defensive Back is playing Off Man coverage with their run fit being inside the Defense End. However it can be adapted to other Defensive Systems. 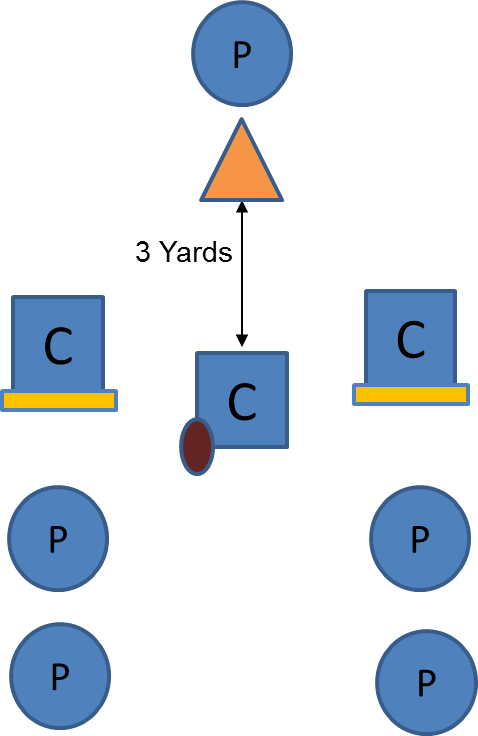 With the Defensive Player’s head turned the Coach instructs the Tight End to either Down Block on the Defensive Tackle cone, Stalk Block the Defensive Player, or run a pass route. If Down Block, the Defensive Player executes his Run Fit between the Defensive End and Tackle. 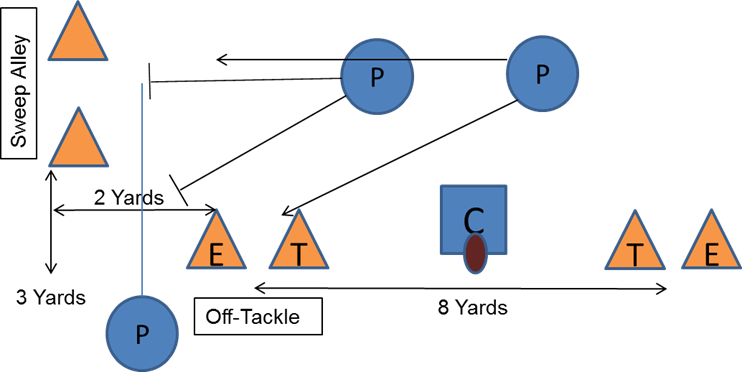 If Stalk Blocked, the Defensive Player uses his hands to make a Swim Move keeping outside leverage and executes his Run Fit between the Defensive End and Tackle. If Pass Route, the Defensive Player covers the Tight End trying to break up the pass from the Coach. After several reps, flip to the other side. 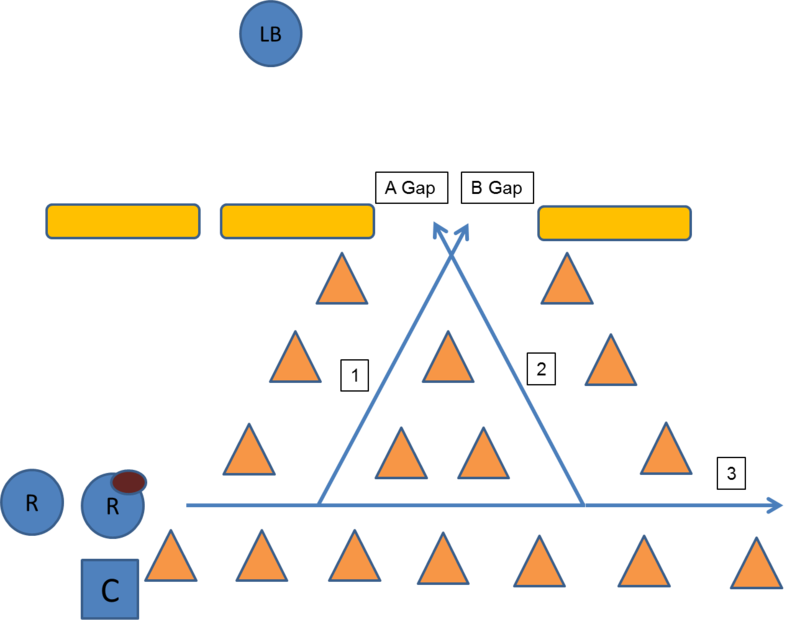 Designate 1 cone as a Defensive End and 1 cone as a Defensive Tackle. Offensive Player lines up as a Split End. Defensive Player aligns on the Split End per their alignment rules. With the Defensive Player’s head turned the Coach instructs the Split End to either Stalk Block the Defensive Player or run a pass route. If Pass Route, the Defensive Player covers the Split End trying to break up the pass from the Coach. If you are looking for additional Defensive Back drills for your youth football team, we highly recommend, that you take a look at Coach Mahoney’s Less is More Approach to Defense and Training up your Cornerbacks clinic.